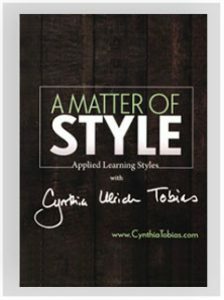 Cynthia Tobias shares 52 of her popular video blogs! These 90-second discussion starters come with a reproducible workbook available in PDF format. Great for use in families or groups-or just for individual benefit! Each session includes a workbook page with references for finding more information and thought-provoking quotes that stimulate conversation. 2 DVD set. Includes 1 DVD and 1 DATA CD that contains the reproducible workbook. (PDF Format).